It felt like I exerted more energy during the last 6 miles than I had during the previous 20. I really had to focus on just putting one foot in front of the other and plodding along mile after mile. This was made increasingly tough due to the many hills on the back portion of the route. Long, drawn out hills that just zap your strength. I ended up really slowing down going up these but felt really awesome I didn’t have to stop and walk. As I reflect on the last 5 months of training and the race itself I know the following five things helped me accomplish this feat (and, by the way, they have great similarities to developing a quality financial plan that will help you prosper). 1. Setting Goals. I had tried on many previous attempts to start a running program. I failed time and time again because I did not set a goal that was very specific. Saying you want to run to lose weight or get in shape are nice thoughts but they don’t really carry much detail. The details are what helps drive one to the goal. How much weight do you want to lose? How long is it going to take you? Do you actually have a good chance to achieve the goal? These details are much more specific and in the end give you a target to shoot for. I would never have accomplished this without setting a goal on which to focus. It was the driving force that kept me going during training and during the race. Are your goals specific, measurable, and attainable? Do you have any for your personal finances? 2. Have a Plan to Follow. I really had no idea where to begin but hey…other people have done this, so there must be some good ideas floating around out there. So I researched and found lots of good plans with schedules to follow that would guide me step-by-step through the training process. The plan that stood out for me came courtesy of Hal Higdon. This took the burden of planning off of me and simply allowed me to follow the plan. That may seem like an insignificant difference, but I would have been chasing after the wind had I been forced to develop something on my own. Thanks Hal! Are you following a financial plan that’s proven? Is it actually working for you? 3. Discipline. Once the plan is in place I had to follow through. There was no wavering or deviating from the plan. I knew I could not wake up one Saturday morning and say, “I think I’ll just skip this 15-miler today…I’ll be fine.” It may feel good in the moment to stay in the warm bed instead of getting up so early. That decision, however, could leave you vulnerable to unwanted body stress and injury on future long runs. Finding the discipline to follow through is extremely difficult to consistently manufacture because we can be incredible weak-minded at times. 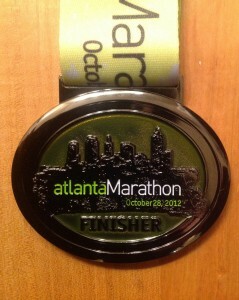 It was, however, essential for me to complete this marathon. 4. The Right Equipment. The right equipment makes all the difference in the world. It can be the difference between an enjoyable, fulfilling run and one that leaves you discouraged and in pain for days. Some equipment exponentially increases your desire to push yourself. I noticed my training accelerated to a new level when I purchased my Nike+ GPS watch. It gave me instant feedback as I could track my routes, their elevation, my pace, and the calories I burned. These indicators encouraged me along the way in that I could tell progress was being made. How do you know what the right equipment is? Read what works for others and then test and measure what works for you. You will learn real quickly what works and what doesn’t. Do you have the right financial equipment (i.e. budgets, savings, IRAs) working for you that will allow you to prosper? 5. Getting Encouragement. There were hundreds of people who didn’t choose to run in the race but were vital to me completing it. They served as volunteers and cheerleaders all along the route, passing out energy drinks and cheering us along. I didn’t personally know any of the volunteers, but I felt really encouraged each time one of them called my name and said, “Good job Brian, keep it up.” Realizing how good this felt, I found myself passing words of encouragement along to others towards the end of the race, talking to other runners who were struggling through their pain. But there were seven people I did know who came to the race and have supported me all through my training – my wife, my four great kids and my parents. Seeing them at the race, cheering me on, brought about a very welcome extra boost of adrenaline. Thanks…you guys were awesome. A little encouragement goes a long way. It’s the positive energy you need to keep going. Do you have anyone on your side? Who is challenging, encouraging, inspiring you?